Includes Catching Helmet, Chest Protector & Leg Guards. Recommended Age Group 9-12. Catching Gear Ideal For Entry/Intermediate Level Players. High-impact-resistant ABS plastic shell designed to absorb & deflect. AEGIS Microbe Shield helps against odor-causing microbes. Soft, breathable dual-density lining materials in the mask. Ventilation holes where you need them for greater breathability. Mask features I-Bar Vision steel cage to increase cage strength & allow more vision. Chest Guard uses moldable plastic inserts at throat, sternum & shoulders for added protection. Leg Guards have repositionable, washable shin & kneepads. 9-12 Catching Helmet hat sizes 6 _ to 7. 9-12 Chest Guard 14.5" sternum to navel. 9-12 Leg Guards: 13" from cleat to kneecap. Warning: This product is designed to minimize injury from minor impacts to the sternum and chest area. It is not guaranteed to reduce the risk of Commotio Cordis, a rare but sometimes fatal injury arising from sudden impact to the heart. Impact Protection - 10mm Pad professional foam padding protects against sudden impact and minor injuries from balls, pitches and hard hits to the sternum, ribs, heart, and chest area. 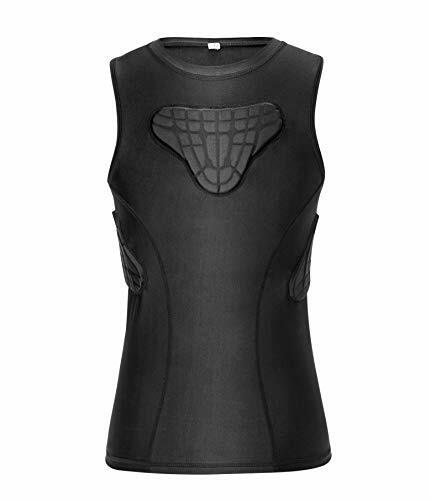 Padded Compression Shirt for Boys - Mesh fabric across shoulders back and sides for superior breathability, Quick dry technology makes your body cool and dry. Perfect for Baseball, Football, Softball, T Ball, Lacrosse, Paintball, Catchers, Rugby, Goalies, Pitching and Batting. 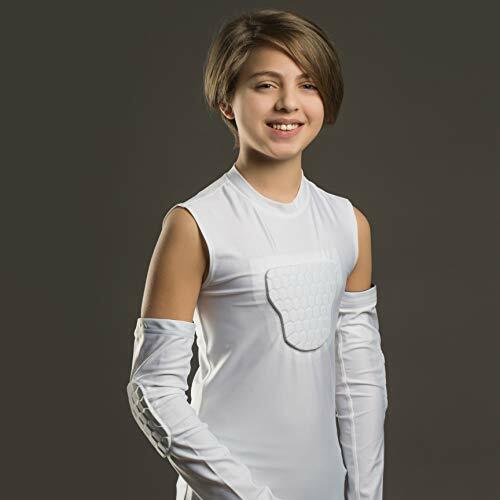 The Padded Sternum Shirt can keep your child safe when they are competing! 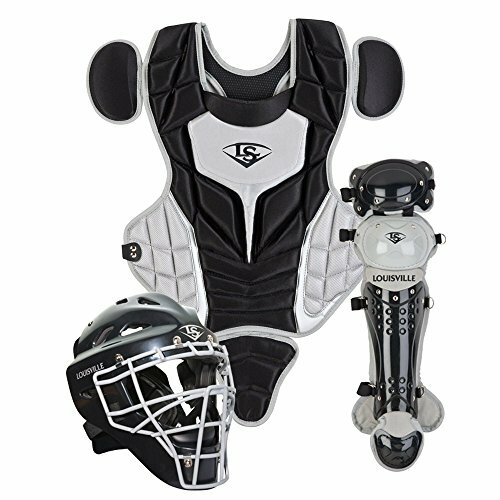 Overview * Quality protection from top to bottom for your young catcher * Includes catcher's helmet, chest protector and leg guards * Two sizes available: Ages 6-8 (Junior Youth) a Ages 9-12 (Youth) Features * Catchers Helmet: * Durable ABS shell provides superior protection * Smaller design made specifically for youth sizes * Durable steel cage * Soft vinyl chin pad * Size:A 6 1/8" - 7" * Chest Protector: * Velcro closure attachment system for ease of use * Double back adjustment mechanism * Great for beginners * Size: 12" (Junior Youth) a 13" (Youth) * Leg Guards: * Lock-down closure attachment system * Double knee design * Protective PE shin plate * Size: 12" (Junior Youth) a 13" (Youth) A Helmet ConstructionThe hockey-style catchers helmet features an ABS plastic shell, durable steel cage, and soft vinyl chin pad. A Adjustable FitGreat for beginners, the chest protector features a Velcro attachment system and double back adjustment mechanism. A Double Knee DesignThe leg guards feature a double knee design, protective PE shin plate, and lock-down closure attachment system. 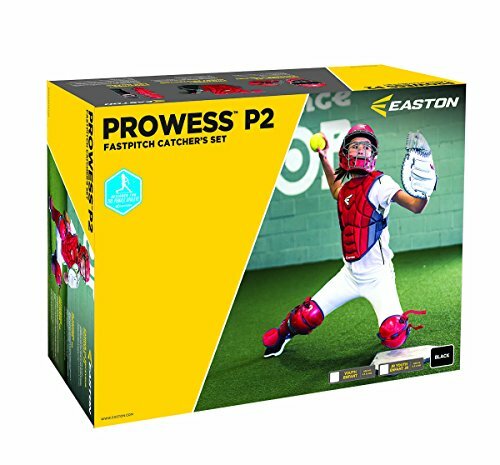 The Black Magic Catcher Box Set from Easton is made with a smaller design specifically for beginning youth players. The Black Magic Helmet delivers full face and head impact protection with a tough ABS shell and a steel cage. The helmet's lock-down closure attachment system offers a secure fit and ease-of-use. The Black Magic Leg Guards have a protective PE shin plate design with double kneecaps for mobility behind the plate. The chest protector features a double back adjustment mechanism with an easy to use Velcro closure attachment that offers growing players a custom fit. What's in the Box? 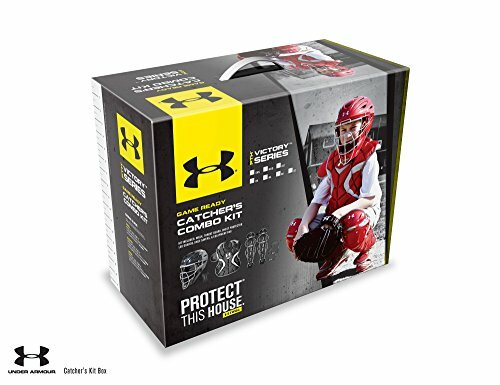 HEART PROTECTOR Help keep your young athlete safe on the field with a PROBAY youth Heart Guard t-shirt from Baseball Protect. Thick, triple-stitched heart protector padding is perfectly positioned over the chest/sternum to protect a vulnerable area of the body and help prevent injuries. The durable, highly absorbent padding cushions impact from hits, throws and contact from other athletes. Play ball and play safe! COMPRESSION FIT Our sleeveless crew-neck baseball/softball shirt was fabricated for comfort and function. Its compression material allows athletes to move freely without restriction. 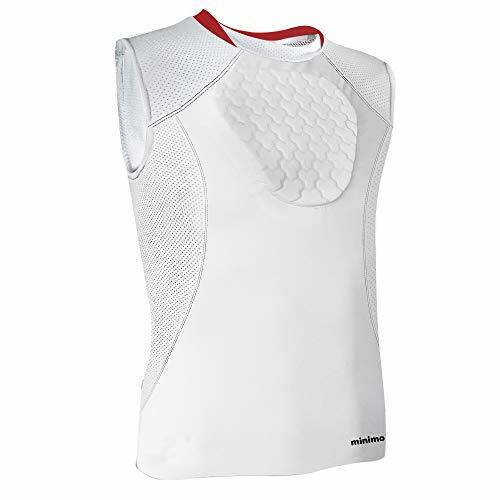 The white compression top can be worn alone or underneath another shirt or uniform for extra protection during every practice and game. MOISTURE WICKING When the action heats up, this performance tee goes to work, wicking away sweat before it builds up and leads to overheating. Players will feel cool, comfortable and confident inning after inning. STRETCH FABRIC The PROBAY youth chest guard shirt was made with special STRETCH SHINE fabric to be soft, stretchy and breathable in all the right places. We use lightweight yet durable 250gsm material for enhanced comfort and durability on the diamond that lasts all season long. OTHER SPORTS Here at Baseball Protect, we take pride in manufacturing quality products. Our heart protector t-shirts fit both boys and girls and are also suitable for other sports and outdoor activities like basketball, football, volleyball, fastpitch or slowpitch softball, rugby and more. - SIZING: Youth Medium: Chest Circumference: 28-30" (Boys 14-16); Youth Large: Chest Circumference: 31-33" (Boys 18-20). Measure chest size to fit snug. - NOTE: This product is designed to minimize injury from minor impact to the sternum and chest area. It does not guarantee to reduce the risk of Commotio Cordis, an often fatal injury caused by sudden impact to the heart. Heart-Gard is a tough, high density polyethylene dome that absorbs impact energy and forces it away from the heart. It is small in size, measuring 6" x 6", yet the rigid plate covers this vital area. When worn under the uniform, it is virtually invisible and does not restrict movement. It is cool and weighs less than 3oz. so kids forget they are wearing it. Adjustable elastic straps. Black Magic helmet (6" - 7").Black Magic chest protector (14").Black Magic leg guards (11.5") . The System7 Axis Set includes the MVP2500GTT mask, CP1216S7X chest protector, and LG1216S7X leg guards.Helmet Graphite two-tone finish High-impact ABS shell UltraCool mesh liner is extremely protective and very comfortable Patented I-Bar Vision face mask for increased strength, increased field of view and lighter weight Fits 7 - 7 1/2 Chest Protector Wedged abs for blocking, internal and moldable PE protective plates for protection and fit Diamond Vents line the back for even more weight reduction and breathability Stainless steel matte black hardware Seamless TPU sonic welded logo Thinner and more form fitting DeltaFlex harness Improved break points which present a flatter surface for blocking, improving control Size: 15.5" Leg Guards LINQ hinge system for the best mobility (allows the leg guards to move with the leg as it bends) Single top strap remains behind thigh without dropping behind back of the knee Reinforced front double knee protector straps for added durability Wider and smoother knee for better pivoting and sliding Repositionable center knee pad with D3O padding Diamond Vents line the back for even more weight reduction and breathability Stainless steel matte black hardware Size: 14.5" Recommended for ages 12-16. 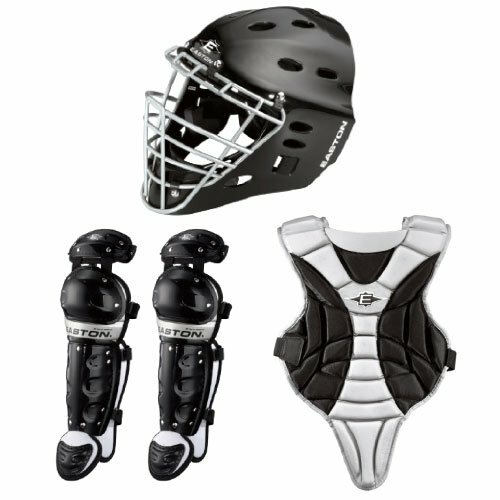 The System7 Axis Set includes the MVP2500GTT mask, CP1216S7X chest protector, and LG1216S7X leg guards. Includes carry bag, throat guard, and wristbands. 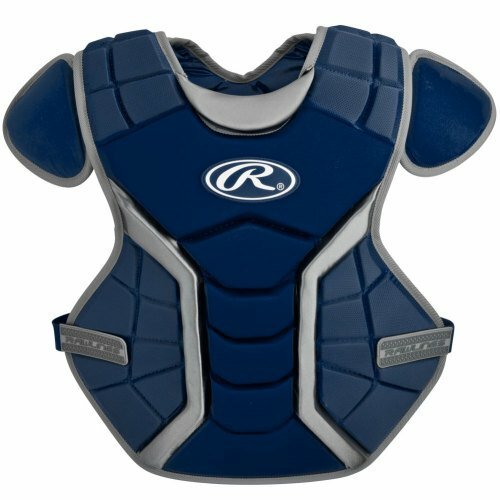 Rawlings chest Protector easy-on, easy-off Rawlings renegade chest protectors feature "C" channels that create a form-fitting wrapping of the chest Protector for maximum mobility and durability. The ab wedges remain flat for added ball rebound control. The lightweight design and Velcro a straps allow for easy-on and easy-off access that will not hinder mobility. Rawlings chest protectors feature: "C" channels create a form-fitting wrapping of the chest Protector for maximum mobility and flexibility lightweight design allows for maximum mobility without sacrificing protection Velcro a equipped straps for easy-on easy-off attachment system ab wedges remain flat for added ball rebound control dual density foam for protection and comfort. Perfect for Football, Lacrosse, Basketball, Baseball, Hokey, Rugby, Paintball, Snowboarding, Skiing, Soccer, Cycling and all other contact sports. 10mm professional foam padding integrated with breathable fabric. Moisture wicking and elastic, keep your body cool and dry,offer great flexibility when moving. Offer great support and protection on chest, sternum, heart, ribs and lower back. Parents keep your child and players safe while they compete! Shirt Size (Chest): YS=25-26.5inch YM=26.5-28.5inch YL=28.5-30inch YXL=30-31inch; Machine Washable. 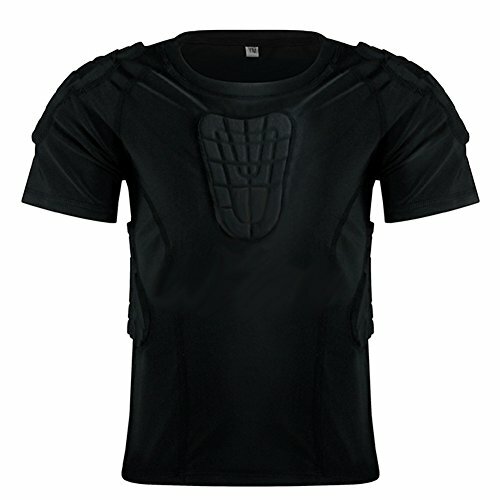 Chest & Rib protector shirt. Great for Kids football padded shirt & paintball padded shirt & basketball rib protection vest & baseball catcher chest protector! Keep warm in cold temperatures, keep cool in higher temperatures, high protection performance. High elastic polyester fiber, super breathable, EVA anti-collision particles of polyethylene greatly improve the safety. Protect your ribs, shoulders, chest and neck bones and make any exercise safer for your child. Designed for football, basketball, rugby, football, paintball, hockey, baseball and all other contact sports.